A stand-alone movie starring extreme Spider-Man opponent Venom looks, from a distance, like a beacon of ’90s nostalgia, addressing that era’s tendencies to go big and fan-baiting in its comics yet weirdly small and chintzy in its comics-based movies. (At least those that don’t feature Batman.) But as it turns out, Venom, the solo vehicle for the symbiote-based, head-chomping antihero, has more of a mid-2000s vibe. It’s reminiscent of the post-Spider-Man, pre-MCU superhero pictures, the ones made with some degree of star power and/or production value but lacking a sense of purpose beyond showing off a live-action exclamation of a famous comics character. It’s Daredevil! It’s Ghost Rider! It’s the Fantastic Four! What else do you rubes want? That’s a particularly apt question for Venom, constantly in danger of becoming an attitude in search of a personality. At least when he was shoehorned into Sam Raimi’s Spider-Man 3, Topher Grace provided some pathos and smarm in his abbreviated screen time. In the new film, the pinwheeling alien goo still takes journalist Eddie Brock as its host, but the character is reimagined as a slurry, mumbly Tom Hardy and relocated to San Francisco, where he hosts some kind of eponymous investigative program and canoodles with his lawyer girlfriend Anne Weying (Michelle Williams). When a spaceship owned by tech mogul Carlton Drake (Riz Ahmed) crashes to Earth with alien symbiote samples, Brock investigates—or more accurately, he’s inexplicably summoned to Drake’s mountainside base to conduct a puff-piece interview to improve the company’s PR. Brock is appalled, but instead of refusing, he nicks some information from Anne, whose firm happens to be working with Drake, and confronts him over the spaceship incident, landing both Brock and Anne in hot water. So when a whistle-blower (Jenny Slate) wants to expose Drake’s deadly human/symbiote experiments, she calls a near-destitute Brock to finish the job. Instead of a hot story, he winds up with an intense parasite. The introduction of the parasite is supposed to tease out the darkness in Brock, but at the outset he seems less ethically compromised than simply not very bright, and Williams appears at a loss with how to approach her barely-written voice-of-reason character. The movie also takes a while to get Brock infected with Venom, possibly because it doesn’t have that many ideas about what Venom might do beyond fight anonymous groups of Drake’s henchmen. But Hardy seems determined to sweat it out anyway, playing the transforming Brock as a harried Dr. Jekyll (sans scientific knowledge) to his alter ego’s rampaging (though largely still just defensive) Mr. Hyde. Venom speaks inside Eddie’s head in a low, devilish mumble even when his toothsome, Spidey-on-acid caricature of a face stays hidden. As Brock grows accustomed to his powerful, willful guest, Venom has some fun dragging him along for a series of noisy chases and fights. The best moments toy with a kind of superhero body horror, but the movie never fully commits to that angle, maybe to appease a ratings board and perceived audience of 13-year-olds (isn’t that who Venom was designed to please? ), or maybe because director Ruben Fleischer (Zombieland) is more interested in the comic possibilities than the horrific ones. That would be fine too, if he pushed the screenplay’s weirder ideas, mostly involving who else might host the symbiote, a little further. A parallel sequence of another symbiote body-hopping its way from Malaysia to San Francisco has both comic and creepy promise before it devolves into piece-moving. Whatever its reasons, the movie downplays a lot of its sci-fi and horror elements, and at times resembles a Jason Bourne reluctant-badass riff, complete with a scene where Ahmed barks orders from a control room. 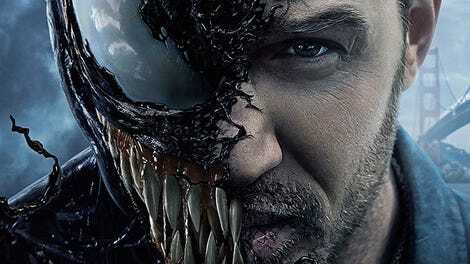 Venom is watchable in its silliness as it toggles between Hardy’s mush-mouthed befuddlement (that includes the scenes where he’s playing 100-percent human) and the impossible grotesquerie of the CG Venom, which may not be vastly more impressive than the 2007 version but is certainly—true to its source material—bigger, more muscular, and featuring a more ridiculously outsized tongue. Not every superhero production needs to be as house-styled and tastefully calibrated as the typical MCU entry. Many of those movies are good and some even touch greatness, but they also come out at a rate of two or three per year, and there’s something to be said for not insisting on a reverent, uniform treatment of every last character who’s ever appeared in Marvel comic books.